It was a regular old morning. I'd gone to bed far too late and woken early with my little one. Bleary eyed I poured her weetbix and sat at the table phone in hand waiting to wake up. I was looking at something silly. Rental accomodation. I can't remember why. Then a little voice peeped up. I had been trying to make a routine of sitting down at the table in this very same way to read the bible and start my day with a little encouragement and joy. I'd made a pretty good start of it but late nights and lack of discipline had slackened me down. What a beautiful reminder out of the mouth of a babe. I'm not about shaming myself or feeling low and gloomy 'cause I missed a few days. That's not where my worth lies. But I am about doing something I love, enjoy and get so much out of with integrity. Here's where that new little button on the side over there comes in. 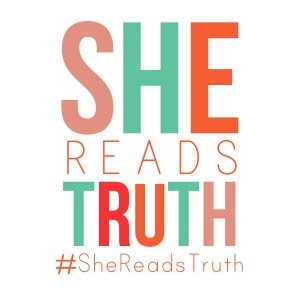 It's called "She Reads Truth." It's about women reading the Word together. It's about daily reading plans and devotionals, scribbling your thoughts and sharing them with others. It's about being that little voice at the breakfast table who reminds you to do what you love. It doesn't have to be the only reading you do. You can join in or out as you like but if you're like me and sometimes struggle to get going it's a great way to get a friendly loving poke up the hiney.